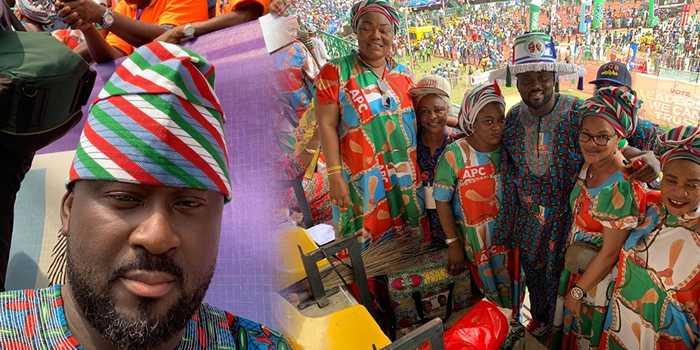 Photos of Nollwyood actor turned politician, Desmond Elliot, at the APC rally in Lagos are currently making waves online. The 45-year-old Lagos state house of assembly member was captured campaigning for President Buahri. 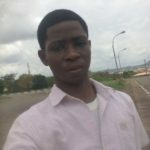 It has been reported that Lagos residents have been groaning over the effect of the rally which has seemingly shut down the commerce capital of the country. While some are locked in their homes, thousands have reportedly poured out to show their support for Buhari’s second term bid, including Nigerian celebrity, Desmond Elliot. Desmond is however not the only Nigerian celebrity supporting President Buhari. Recently, a group of actors in Lagos state announced President Muhammadu Buhari and Babajide Sanwo-Olu as their preferred candidates in the forthcoming election. Meanwhile, the internet was moved over the emotional moment a young lady burst into tears upon seeing President Buhari in Taraba state.